Last month, Harper’s commissioned something unusual. Unusual in the context of our tight-pursed digital world. Less unusual, perhaps, in the heady (nearly bygone?) literary indulgence from which the magazine sprung. Harper’s, based in New York City, flew a British writer across the Atlantic and, once in The Big Apple, covered her sprawling tab at New York’s most elite restaurants. Then they cut her a cheque—and seeming carte blanche—to fill up their pages with any ensuing adventures. The piece seemed preordained by the magazine’s weighty masthead to be free-flowing and diaristic, spared the publication’s usual tight oversight. New York food writers and bloggers generally hated it. @hels I was so annoyed by the writing in the press release about it I rage deleted it w/o reading article. Seems I made right choice. Now true, the whole endeavour was slightly un-Harper’s like. But the diaristic style wasn’t an error or oversight. Nor was the writing bad. It was good. At times, fabulous. So what’s the problem, you ask? Well this very fault line, more and more, is where the gap between between food culture, food writing and the reader is being drawn. It would be hard to pick four more towering foodie temples to visit: Per Se, Eleven Madison Park, Chef’s Table and Masa. It should be noted that Harper’s is neither food publication or news magazine. It doesn’t cover a regular “beat”, much less have a restaurant review section. Who knows its mandate in 2015? Though broadly-speaking, Harper’s is still about excess: liberal reflection, the pleasure of the text. …[Per Se] is not a restaurant, although it looks like one. It may even think it is one. It is a cult. 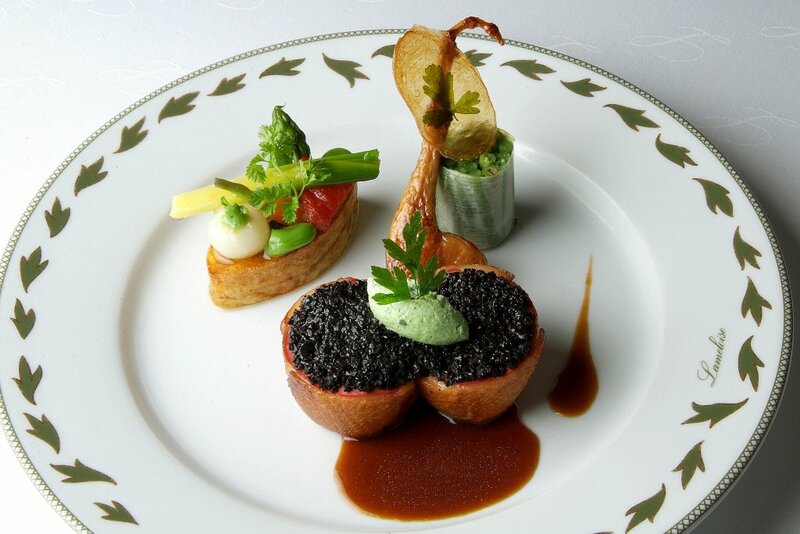 It was created in 2004 by Thomas Keller of The French Laundry, in Yountville, California. He is always called Chef Keller, and for some reason when I think of him I imagine him traveling the world and meeting international tennis players. But I do not need to meet him; I am eating inside his head. Now I’m a long-time follower of people like Keller, a junkie of chef culture and resto innovation through and through. I’m the kind of guy who would waste hard-earned money on these nutty places. Animal Farm may be a metaphor for the anxieties of those who dine at Through Itself: they are hungry, but only for status; loveless, for what love could there be when a waiter must stand with his feet exactly six inches apart … Through Itself is such a preposterous restaurant, I wonder if a whole civilization has gone mad and it has been sent as an omen to tell us of the end of the world — not in word, as is usual, but in salad. What’s more, smug, foreign food critics are nothing new to this scene. Yet at every turn of phrase like this from Gold, I only dove in further. The thing is, it didn’t matter what my food sensibilities told me: this was crisp, fantastical, entertaining, and ultimately — like all good satire —based on more than a small grain of truth. If knee-jerk reactions are to be expected from locals and overwrought foodies, they are worrisome when they come from food writers. Why? Because the stark opposite emerged from another specific group: a global collection of folk that may or may not have cared about famous chefs, or even heard of these places. I can only unify this mass as readers — the targets, after all, of a magazine article. It would seem that readers’ conception of Gold’s essay was different. They perceived it as writing. I'm thankful that, in @Harpers, there is still a home for witty, savage, sophisticated writing like that of @TanyaGold1. And they’d be justified. Let’s leave aside the premise itself: that the magazine doesn’t even do reviews, that the writer was flown in to a city brimming with food critics for an expository feature. Readers got it, knew that they — along with 99.9% of the world — knew they’d likely never set foot in these uber-elite places, or even necessarily have the desire to. — and that was the whole point all along. Readers did not require “disclaimers” of satire or elitism. The thing with “takedowns,” it seems, is once defined, they require “takedowns of takedowns,” each step further distancing readers from any literary agency of their own. Yet to me, this particular saga is exemplary for three reasons: the sheer spectacle of it all, the big players of food criticism involved, and the fact that it highlights the tense space opening up between foodies, writers and food writers. The trend seems to be that dry, cutting, whimsical, food writing should never even edge on brutal or fabulous — it must never go too far off the edge. It’s ironic that food writing started from the edges, with fantastical, metaphorical essays that touched upon food coming from somewhere else. One level head reigned. Pete Wells, New York Times critic himself—tasked with hallmark reviews of these joints over the years—might have captured it best: between diaristic and satirical, Gold was for him not just any writer, she was the foreigner turning heads by flirting at the precipice of food criticism. I fear we are now in for a few rounds of Circle the Wagons. We’re drawn to New York misadventures just as we’re drawn to the ire of Parisians: their hunger to take down their own is outweighed only by their ferocity at defending outsiders from doing the same. Harper’s still exists. I should probably check it out more often. Back when I first started raising this drama, someone pointed me an old Harper’s essay. Turns out, in 1996, they paid Neil Foster Wallace to write about the cruise industry. Suffice it to say that if such a thing came out today, cruise line bloggers (if they exist) would dissect it with glee. Industry experts and travel writers would doubtless be next at the gate. For in the piece, NFW is out of his element — uncomfortably so — and one teeters with him as he lurches along in search of his point. It’s as if his grip on the topic might disintegrate at any moment. Here’s the thing: it is a glorious and riveting essay. So if there’s a lesson for us food writers, bloggers and commentators, maybe it’s simply to take a deep breath. If those of us who care most about the topic keep strangling it, food’s life within language won’t fully thrive. You are what you eat. Unless you want to be Prime Minister. It’s a phrase we hear often these days: eating is political. In other words: we’re actors in food systems. Our decisions carry vast implications—the ethics of the brand we support, say, or the type of living beings we decide to ingest. Yet now that elections are looming, it’s worth considering the literal sense of the phrase. George Washington, after all, is forever associated with cherries: a symbol of humility and aversion to lies. François Mitterand had a not-so-secret addiction to caviar—anathema, said some, to his socialist past. Bill Clinton, of course, was the Prez of BBQ and fried chicken, indulging in the richest of Southern foods, it would seem, whenever opportunity arose. And we all know Obama’s love of quality burgers—especially In-n-Out Burger—frequent stops for him and his entourage that in some ways helped launch his social media persona. We can even find some reaching significance on the plates of our past Canadian PMs. Budget king Paul Martin, for example, had a well-documented obsession with the ultra-frugal Kraft Dinner. If food is the way to the political heart, what do the eating habits of our Prime Minister candidates reveal? Spoiler alert: a mostly opaque snapshot of dullness, disjointedness, and general disingenuity. * (*though if the candidates return my dinner party invitation, more may soon be revealed). Popular opinion, however, is firmly in Mr. Trudeau’s favour when it comes to the culinary. An Abacus poll ranked him Canadian’s top choice “to have over for dinner with your family (43%),” as well as to “cook the best meal (41%)”. (Incidentally, he also outranks cat-loving Harper in the animal category, voted “most trusted to look after your pet (40%)”). What of Mr. Harper, our teetotalling incumbent, who once famously said, “I don’t drink, except when I do.” What be the gastronomical keys to his heart? We’ve boiled long weeks of exhaustive research on this question down to a simple answer: they’re dictated by his PR team each day. Mr. Harper’s ubiquity in culturally-capitalistic food photos is matched only by his ability to appear lifeless when caught by the lens. Harper’s habit of seeming photogenically disengaged is so widely known that regular citizens have dedicated blogs to the phenomenon. One, called Things Harper Does to Seem Human, captures Harper’s utterly unnatural food moments —captioning them with faux-naturalistic brilliance: “Buying candy from a machine. Everyone needs something to munch on while doing a little shopping,” says one. 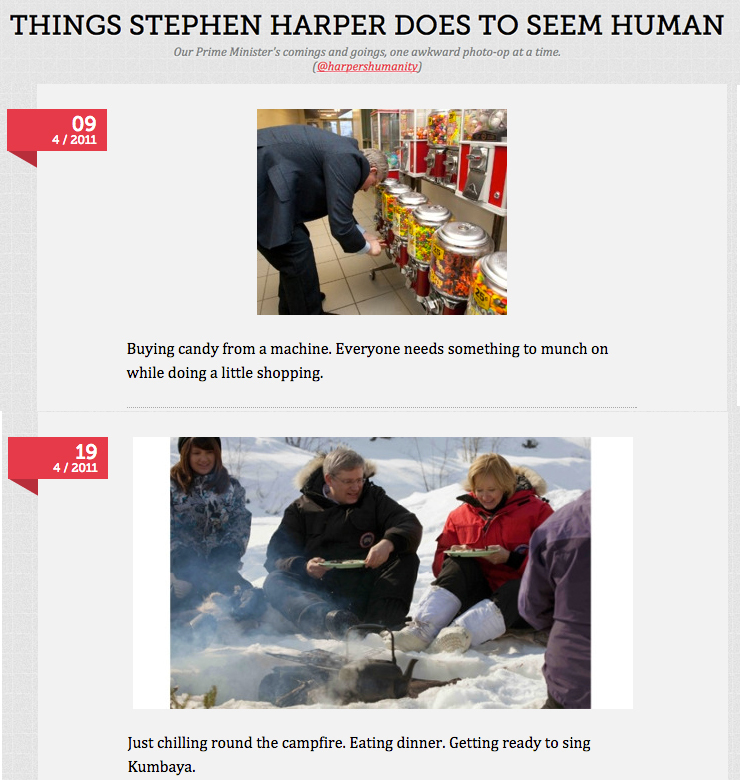 Keenly aware of his poor “normalcy” index, Mr. Harper’s PR team recently crafted a Twitter campaign dubbed #dayinthelife. Yet besides beefing up his already prolific set of cat photos, the campaign’s thick veneer only served to reinforce his lack of humanity further. 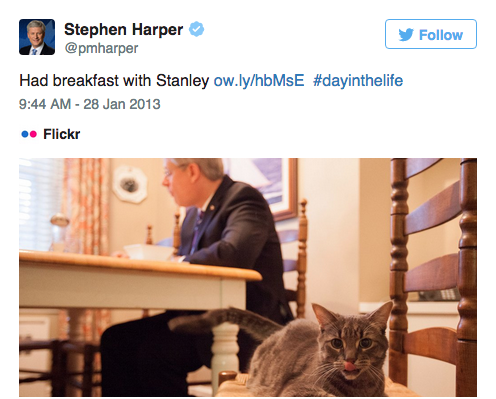 The PM eats some unspecified breakfast which is dominated by Stanley the cat. Near noon, the PM’s “working lunch” is mentioned, though glossed over using lingo from generic dietary trends du jour; the suggestion is that it’s something similar to broccoli and fish (how perfectly healthy). There’s no mention of dinner. Yet there is one thing thing of substance we do know about the PM’s eating patterns. It’s a big one, as antithetical to his stony public image as the perpetual selfies with kittens. Journalists and aides both corroborate that hot sauce is Mr. Harper’s serious vice. He is said to regularly request the spiciest version of any available food, to add jalapenos to his mother’s lasagna and possess a voluminous collection of deathly-hot sauces in his own kitchen. If Harper is intent on ingesting all manner of PR-friendly goods (while secretly mainlining hot sauce late at night with Stanley), Thomas Mulcair is just as intent on abstaining altogether. So-called “angry Tom” has been trying (to mixed reviews) to turn his frown upside down. Yet he remains mad as hell at his food. There is simply no evidence Mr. Mulcair eats. Or that he has ever eaten. Surely not on camera. Even the Maclean’s portrait of the candidate, perhaps the most intimate yet, offers only one fleeting reference to consumption. Mulcair downs some quick hot chocolate (no food)—only after a grizzly daylong trek through the snow. Even food-themed photo ops suggest Mulcair’s disdain for ingestion. Consider Obama, Trudeau or Layton. Each one can be seen wolfing down diner fare at their rural campaign stops. Though Mr. Mulcair uses similar resto backdrops, he hasn’t been seen so much as sipping a cup of joe. Yet no one can accuse the industrious NDP head of slacking off in the kitchen. 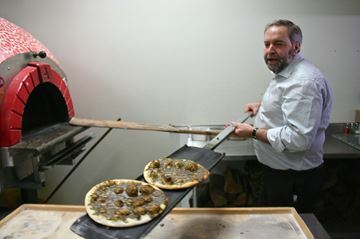 Even when he slaves away at the pizza oven, as at the Brampton pizzeria where he announced tax cuts to small businesses, Mr. Mulcair didn’t indulge in a single bite from his labours. Then there’s those pre-Orange Wave photo ops alongside the eponymous Mr. Layton. Just take a look below. Genuine though his smile may be, Mr. Mulcair conspicuously refuses to share in the pleasure of the bite; meanwhile Mr. Layton is in obvious joy with the food in his hands. The sum of our findings… if they’re findings at all? At best they’re useless – and at worst they are grim. For either these candidates are ashamed of their true passions (a bad sign), or their eating habits are impossibly dull and unconscious (even worse). Perhaps there’s one candidate who proves the exception to this culinary rule. In the fiery vegetarianism espoused by Elizabeth May we see her natural fit with party ideals, not to mention the genuine, seemingly enjoyable relationship to food. She’s known to haunt several Ottawa restos, is loved by the waitstaff, speaks passionately about seafood in her home province of Nova Scotia (though it’s unclear if she ‘cheats’ on the veggie diet), discusses openly her recipes and food thoughts with journalists, and even shows off her unvarnished love for the kitchen on this cooking show. Let’s be clear: this is far from an endorsement of May (or her diet). Though I can’t help be moved by a politician that actually eats, actually experiences food, rather than posing with it: after all, that’s what humans tend to do. First Fridays is essentially food truck heaven. Up to 47 different food trucks congregate on the first Friday of every month until October to offer a variety of foods that will blow you away. Good thing it’s around for a couple of months, because once isn’t close to enough to get a good taste of everything this festival has to offer. There will be live music on scene provided by evenko, so dance away with your taste buds on every First Friday! The Night Market is a monthly block party that celebrates local street cuisine in Montreal. Similar to First Fridays, Night Market features food trucks that offer a variety of food along with entertainment and local vendors. Support the local Montreal food community by heading over to the Mile-Ex on the last Saturday of every month until September! 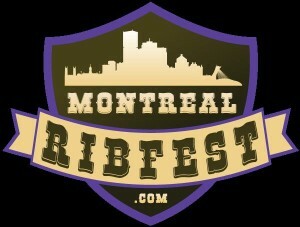 Meat lovers across Montreal have been counting down the days left until the Montreal Ribfest. 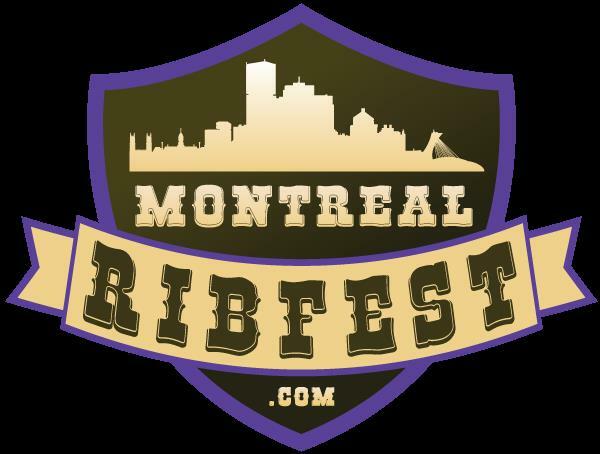 Award winning ribs vendors from across North America will be grilling up a storm to satisfy that ribs craving you’ve had for ages. There will be live music to entertain you while you stuff yourself with a full rack (challenge yourself!). And the best part? The festival supports Canada’s leading youth mentoring charity, Big Brothers Big Sisters of West Island. Barbeque Bonanza is another charitable food festival that will blow your mind this upcoming August. With 26 restaurants showcasing cuisines from around the world and some proceeds going towards the Starlight Children’s Foundation Quebec, this is a culinary experience that you don’t want to miss. The variety of food that will be available at this festival guarantees that no matter what kind of food lover you are, you’ll find your fix. Not to mention that there will be alcohol served. YUL EAT will be a dream turned into reality for true foodies living in Montreal. 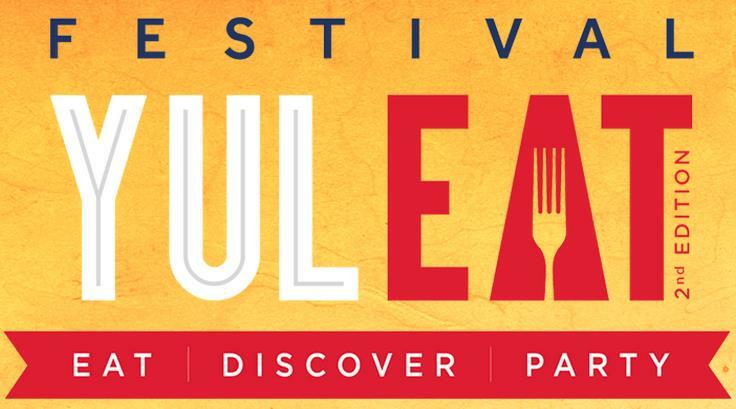 The festival, hosted by Les Premiers Vendredis and evenko, will feature leading professionals in the culinary industry to offer an unforgettable gastronomical experience – along with tastings, markets, demos, conferences, and more. We know this isn’t exactly during the summer, but who will be working during Labour Day Weekend, anyway? #GuacGate: Have foodies lost the plot? Have “foodies” lost the plot? It would seem at face value the answer is yes. That is, if we judge based on public response to an innocuous New York Times guacamole recipe posted earlier this week. This reposted recipe (it was posted on the site in 2013), was not only utterly unshocking, it was merely one of over 17,000 such NYT recipes innocently living in their Cooking section. @nytimes Possibly the worst food advice ever. Just because adding peas to your guacamole doesn't taste bad, doesn't mean you should do it. Have some respect for yourselves. And, hilariously (personal favourite) this. In light of the peas/guac debate, I BELIEVE that means we are due for a pair of farm animals to escape. I’d stand to wager that there are probably more guacamole recipe variations than almost anything other on the Internet. No, I didn’t bother to check that claim, because, frankly, those would be precious moments of my life lost. And that’s kind of the point: the vicious backlash and endless media attention means that someone has clearly lost the plot. The question (if you’ve actually read this far) is: who? To me the biggest is question is why, with access to the finest food writers and chefs in the country (and arguably world), NYT would even bother to (re)-promote such a page. If humous is the go-to lazy person potluck snack, guacamole is easily the second most overmade, over-fusioned, generally, over-dinner-partied dish in the US & Canada. Now, perhaps that‘s a statement about foodies (run out of ideas much?). Though to me, the real fallout of #GuacGate is threefold. Each point is depressing enough to make me want to drown my sorrows in a gallon of habanero-laced peadip. 1. Social media is a scourge upon humanity. “Foodies” really never existed anyway. While most news articles seemed to label this a “foodie” fight, closer analysis reveals that most commentators are the type who comment on everything. Quickly. Without looking. On Twitter. Even closer analysis reveals that most who lept into the (nonexistant) fracas felt compelled to call themselves “foodies” in their Twitter bios. Yet closer closer analysis reveals that, wait, 99.9 % of people on Twitter are “foodies'” according to their Twitter bios. Odd exceptions include the bios of those who, you know, actually cook, serve, grow, or research food for a living. So if social media has made us immune to the impact of profanity, foodie is officially the new f-word. 2. 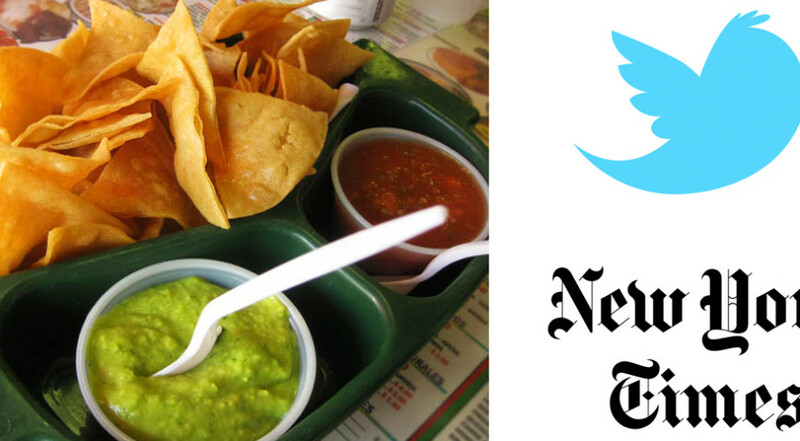 #GuacamoleGate is snapshot of our modern “news” landscape. It’s struck me that the one person least discussed in all of this #GG madness is its very auteur, the one and only Jean-Georges Vongerichten. If and when he’s mentioned, it’s in the last graph of these stories, though often not at all. Tweets? Forget it! Which, you know, wouldn’t be a big deal if he wasn’t the single most significant, if not revolutionary, chef in the world’s restaurant capital for nearly two decades. So, I suppose, we love to scream at each other more than even look at recipe, much less try it, much less learn about its very source. Via a quick media monitoring search, I discovered that two days of guacamole shattered decades worth of Vongerichten media mentions. Personally, I’m happy for him: he’s long escaped overseas, where it must be said, most Twitterers and newspapers seemed to resist the hashtag allure of GuacGate. I’m just sad for the generation who will now forever grow up knowing this legendary human as Guy Who Tried To Make Pea Guacomole And Failed. At this point, I’m tempted to go revert back to my turn of the century ways, and an old proclivity to over-make an equally great party dip, then new to Westerners: hummous. Unlike guac, it’s always been open to change. Oh, supermarkets, what are we going to do with you? It seems you’re embroiled in a certain love-hate relationship with many of us. Think of those farmers: they stock many of your vast shelves, yet often remain resentful for being squeezed. Or the upwardly-mobile, who slag you off in public, all while filling your coffers. Even food waste activists, perhaps your most virulent critics, have also been known to sing your praises. However you slice it, dear supermarkets, it seems we just can’t take our eyes off of you. Here in Canada, for example, you recently roused our spirits by bringing ugly fruit to your shelves, all while appropriating it as a new, cost-saving “brand” promising to quell food waste. Meanwhile, in Denmark, you waded into the edible insect trade, only to pull them from the shelves two days later without telling us why. In Alberta, you convinced the Blood Tribe of your merits, who hope to leverage your model on their land. Yet this nagging question remains: do you really help us gain access to food? Or do you just stand in the way—-you big, boxy bully? Over in the Bronx, a recent high-profile study seems to suggest the latter. Its $1.1M 2010 opening costs were incentivized to the tune of $449 000 (about 40%). However, the team reported no “significant changes in household food availability” to neighbourhood children, with an equal dearth of improved “dietary intake.” Don’t dismiss this as a one-off, supermarkets: the study’s vast sample size (about 2000 children) and lengthy duration (before, during and after the opening) suggest that even your government-fuelled spinoffs might fail to offer tangible benefit to those most in need. Another recent article goes even further, claiming that you might be causing some of these problems to begin with. In “Supermarkets are the problem,” Deborah A. Cohen at Slow Food USA surveys research on impulse purchases at the cash register alongside nefarious-sounding “slotting contracts” in your end-of-aisle displays. In a decisive verdict, she holds you structurally accountable for obesity and chronic disease. Now listen up, supermarkets, because what I’m going to say might surprise you. I think we should cut you some slack. First, determinist conclusions like the latter should be taken with a grain of your finest No Name salt. It’s not only deceptive to pluck out and blame you from within a living, breathing, increasingly-complex wider food picture, it’s dangerous. By over-emphasizing government regulation as an ultimate cure, it effectively disempowers us everyday eaters of the education, choice, and agency we already possess—the type of things we really should be encouraged to strengthen. If for no other reason than you’re not going anywhere soon, we’ve no doubt got a lot to negotiate. Practically speaking, we all find ourselves in your aisles from time to time. Sometimes we’ve driven a long distance to greet you. Other times, we’ve just met you halfway. 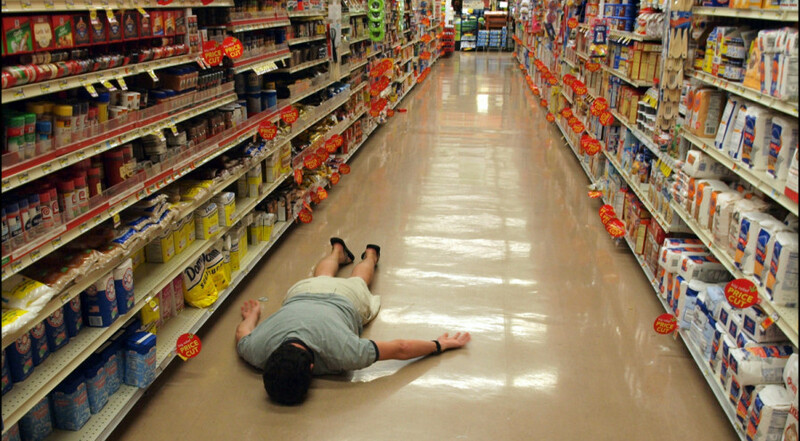 Other times, for many of use, we just get squeezed for options and feel almost forced to wander your aisles. Yet rather than praying to be saved or averting our gaze, it would be better to simply open our eyes. Are supermarkets slowly coming back down to earth? 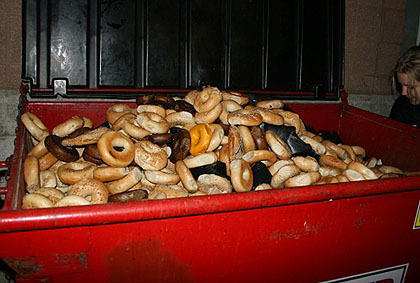 Back in January, I speculated that Canada’s world-leading habit of food waste might soon become too embarrassing to ignore. Following the (real) experts, I pointed towards supermarket waste reform in particular as a key to stemming this horrid tide. It seems that last week, one food giant stepped up to the plate. Though it didn’t touch on the waste problem directly, Loblaws announced that it will roll out the sale of blemished produce. So, in what is perhaps a first for Canadian corporations, a supermarket giant acknowledged that un-cosmetic produce was actually fit for human consumption. Sure, it’s a damn small victory. 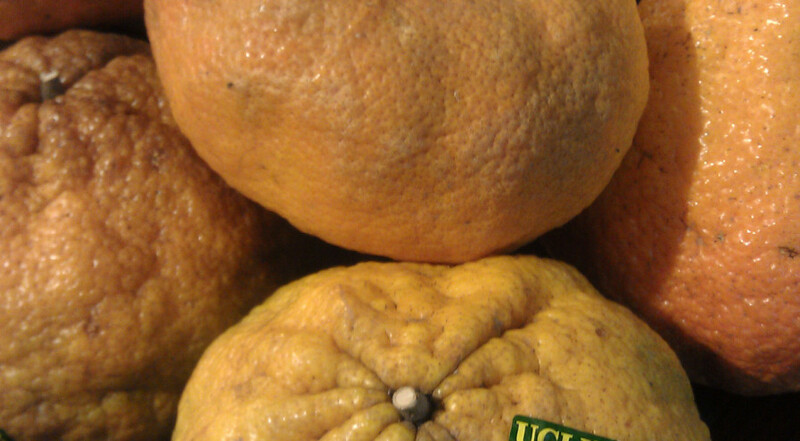 And despite the welcome news, Canada is a latecomer to the ugly fruit game as far as supermarkets go. UK chains began the practice in 2012, while France’s Intermarché giant scored a hit with their Inglorious vegetables campaign last year. What’s more, if you’re reading Forget the Box, you probably get your fruit from farmer’s markets, “Good Food” boxes, overpriced épiceries, dépanneurs, or hell, any other store than a supermarket. So, you’ll probably be quick to chastise Loblaws that this particular brand of “responsibility” is about ten years too late. Still, could it help our society, in some tiny way? The Loblaws produce will come packaged under the label “Naturally Imperfect,” and will stand alongside its picture-perfect cousins, boasting near-equivalent taste. The brand will apply only to apples and potatoes at first, though others are said to be on the way. Those deeply-discounted apples in the saran wrap (think pink 50% off sticker), will not be affected due to this change. Rather, couched in packaging that hearkens back to their popular, 90s-era “Green” and “No Name” brands, the cut-rate, yellow-bagged produce will stand as its own brand, buffered by similar rhetoric that brought the latter to fame. You can almost feel the spirit of Arlene Zimmerman rising from this golden marketing-speak. So while “Naturally Imperfect” promise a return to the mass market for tonnes of neglected apples and potatoes, it is also a new “product” in its own right. The homely castaways seem expertly engineered to cash in on a portion of the market that—for some insane reason—other chains have been afraid to tap. The product is already selling PR-wise. Loblaws’ official announcement last week was a runaway media success, with nearly every single mainstream news organizations picking up the press release—most funnelling it through largely untouched. Even hip restos got behind the announcement, sharing it in droves. You have to wonder why an influential brand like Loblaws waited so long to cash in. All hype aside, I truly do hope this will have some meaning. Perhaps the trend will ripple through other chains. Or, at the very least, perhaps a sheltered Canadian child might get to see what normal vegetables look like—possibly for the first time in their lives. It’s once again time to roam the frozen streets in search of performative emancipation. To keep you energized, here’s a randomized list of edibles available between 7 pm to 3 am. 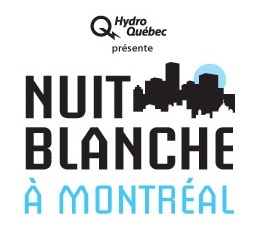 Spontaneity is key here – so when it comes to Nuit Blanche food in 2015, pick what you like in the heat of the moment. 1) Well, fine, maybe you’re the linear type. If you want a basic starting point, pay hommage to the Swiss theme of this year’s Montréal en Lumière fine dining program and warm up with some mouth-burning FONDUE. Other than the severely lactose-intolerant and this guy, who can, POSSIBLY, SAY NO TO FONDUE? 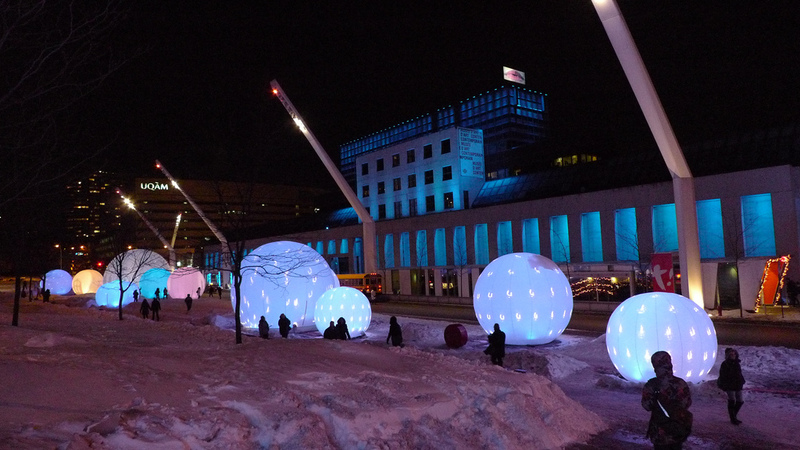 What’s more, you’ll start your night off at the base of all activities: Place des Arts. –> Until 3 a.m.
2) Next, as the world is caving in all around us, why not pay tribute in an ironic way to the oil sands with a fracking-themed cocktail? Half-awareness tactic, half (hopefully) innovative gustatory delight, the Maison du développement durable has you covered with various edible “curiosités de pétrole.” –> Until 2 a.m.
3) Though not technically a food event, the Salon du Livre Gourmand makes use of the BaNQ’s always well-curated exhibition space, and this year the theme is feasting. Is this free feast for your mind’s eye worth it? Why, that’s alimentary, my dear Child! –> Until 11 p.m.
4) Over in the Plateau, the cuvée d’hiver promises a ton of spiritual uplifting, from whisky to microbrews. Try a few bites at this event at the Église Saint-Enfant Jésus and catch some rock’n’roll – with electro-swing? Huh? anyway… Let me know when you get there!) –> Until 2 a.m.
5) Some people spend decades trying to get their name in lights. For $2, get can get your name in chocolate. –> Until 1 a.m.
6) Le “Snow Food” is all about exploring the modes of outdoor eating. 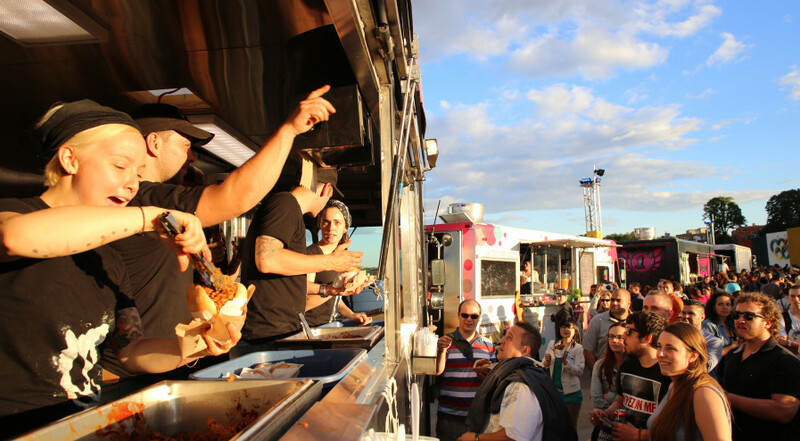 A special version of the Food-Truck-Fridays at Parc Olympique, this polar extravaganza by the Association des restaurateurs de rue du Québec is a sure bet, and a good way to get out east to check out the art of the Pôle Parc Olympique. –> Until 1 a.m.
7) Over at Artexte’s exhibits, you can get free hot choco while they’re still open. –> Until midnight. 8) Another polar menu is offered over in Parc Lafontaine by the quaint Éspace Lafontaine. Chef Martin Bérubé’s QC-focused goods feature polar salmon, something called “crispy storm” and a Qweebek Turkey kebab (not a Turkish one…get it?) Beers and wines on offer, too. –> Until midnight. 9) Similar to last year at the Montréal Museum of Fine Arts, you can check out candies and mulled wine – though this year while you’re perusing the exhibits of the Musée d’art contemporain. –> Until 2 a.m.
10) Finally, in the spirit of pure conjecture and blatant prejudice on my part, try out the Belgo building, which I love on Nuit Blanche, and whose art purveyors usually tack together some wacky snackbar, and maybe a dance party or disco as an added bonus. One never knows where your frozen-on-the-outside, sweaty-on-the-inside feet will lead you. 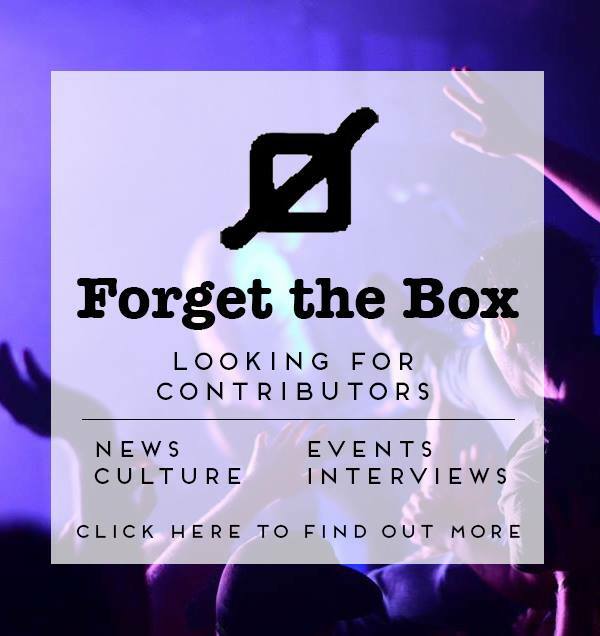 11) A user-generated “bonus” option where you help us fill our pages! Found your own tasty stop? 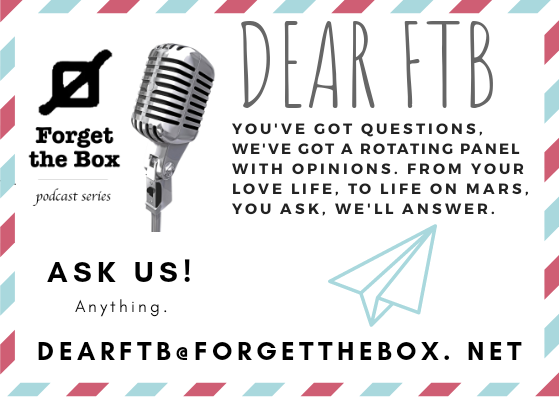 Let us know: @ForgetTheBox or @JoshDavidson. P.S. : we’re also going to be live-tweeting (until we get too cold, too lost, or too drunk), so keep us informed of your best discoveries all night long for some sweet, satiating retweets! 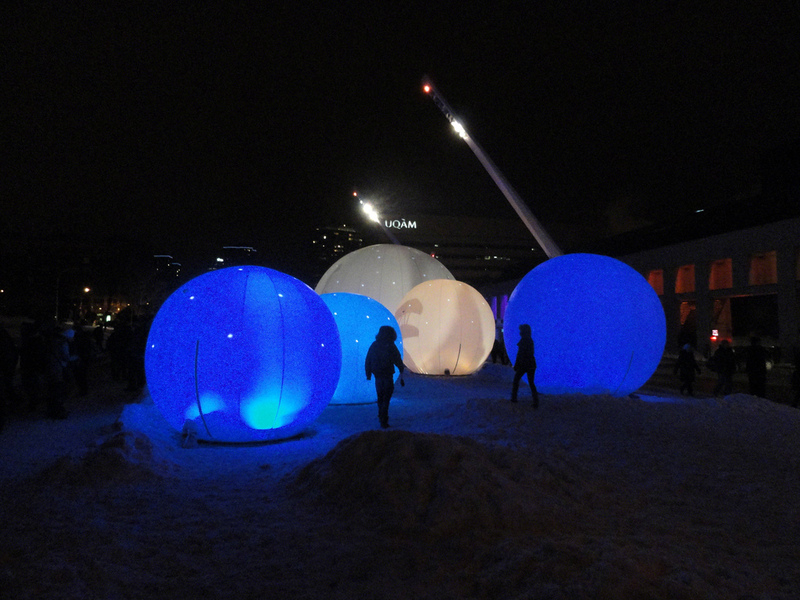 We’re nearing the yearly gastronomical frenzy at the venerable Montréal en Lumière festival (Feb. 19-Mar. 1), purveyors of Nuit Blanche (Feb. 28). 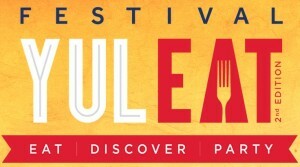 This years’ offerings are more luxuriant than ever, and while the free outdoor site will be on hand for cheaper (corporately-sponsored) thrills, the real delights are to be found in dining rooms at the four corners of town as hundreds of global guest chefs descend upon our city. 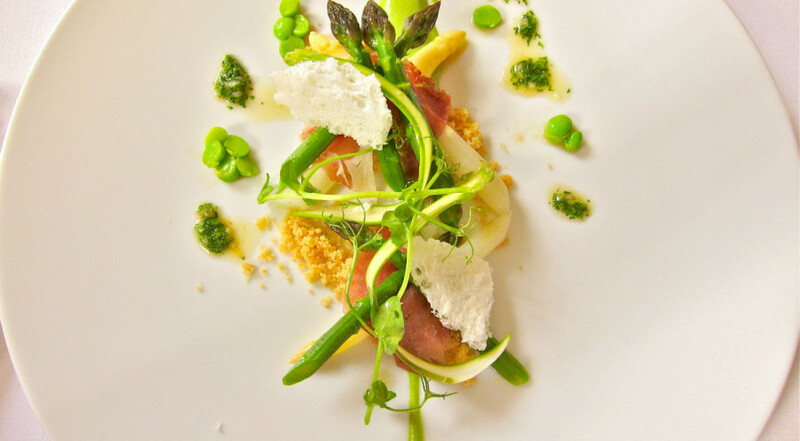 In its first year as a UNESCO-recognized gathering, Montréal en Lumière doses up the usual geographical mashup to guide the culinary program: Switzerland, Washington DC and Lanaudière. I’m not going to pretend to find some throughline for these three places, so let’s jump into particulars. 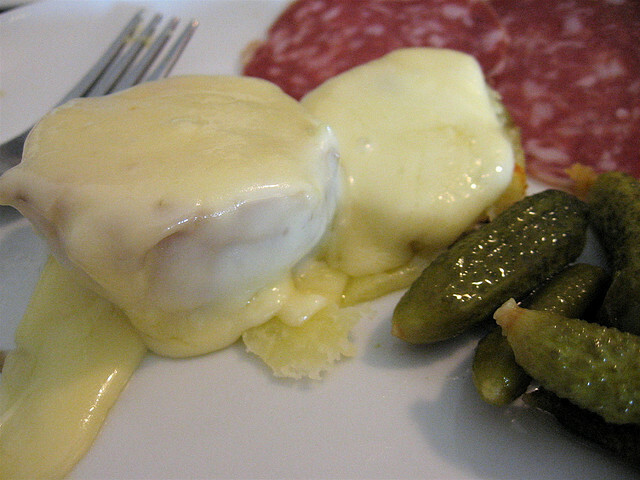 Old Swiss food conjures up images of chocolate and cheese. Of course, things have long since changed and Montréal en Lumière is helping to smash stereotypes with a barrage of Michelin stars. From my count, we’re looking at a total 9 Michelin stars, if you tend to count that kind of thing. Guest chef menus are vague, yet styles range from classic French to tapas, crossing kitchens from La Chronique to Maison Boulud. Prices vary wildly yet tend on the pricier side. For example, the “World’s Best Sommelier,” Paulo Basso, will pair wines at overfluffed Europea with Paul-André Ayer’s dishes for a smooth $300. For choco-cheese addicts, however, the rich nation’s iconic delights are on show across a flurry of fondue dinners, chocolate-inspired menus and all-you-can-eat raclette evenings. These tend to be more moderately priced. Personally, however, I’m more interested in the focus on Lanaudière and Washington: two more “emerging” culinary scenes. Despite its general eminence in all things political, DC has never really found the same culinary footing as NYC, Chicago or even San Francisco. Yet its culinary riches are developing: ethnically varied, innovative and well-financed chefs have recently brought some amazing ventures to the forefront. Big names such such as Equinox‘s Todd Gray and uber-competitive TV wonder Mike Isabella of Kapnos fill the program and are likely worth the tab. However, from past experience, I’ve found the wine evenings can sometimes be the most revelatory—with dishes more odd & exciting than the headline dinners. In this spirit, check out Marjorie Meek-Bradley at the always-pleasurable Pullman wine bar. As for Lanaudière—that Nor’Easterly region right next to Montréal—well, what do we really know about its chefs and traditions? Top pick (and likely to sell out first) is Nancy Hinton’s guest spot at Les 400 Coups. Her rural joint Les Jardins Sauvages was the subject of great fanfare & controversy last year as duelling critics Lesley Chesterman and M-C Lortie disputed its merits. For a more low-key introduction to our neighbouring region, however, check out the Jean-Talon Market for local products and demos by Lanaudière cooks. For amateurs of the peculiar world that is Québec culinary TV, you can brush elbows (and determine the financial fate) of four favourite Les Chefs! contestants in a $100 a head 12-course competition dinner. Last and not least, the always-educational UQÀM agro-gastro talks come to the festival this year with a séance on olive oil. Tastings included. 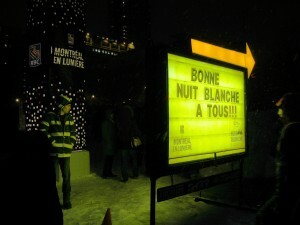 The real wacky & budget friendly food thrills, however, are often found on Nuit Blanche. As we did last year, we’ll be providing a list of cheap (or free) thrills just prior to Feb. 28. What issues will Canada face in 2015? Let’s look to food for answers. Another year, another round of increasing challenges–and opportunities–when it comes to feeding the world. Closer to home, we can see many of our most salient national issues (healthcare, climate change, aboriginal rights) refracted through the eye of a handful of food questions. Food is just that: a flashpoint around which all else swirls. Here are a few simple food questions to keep tabs on this year. As you’ll see, they speak volumes on wider issues we face from sea to sea. 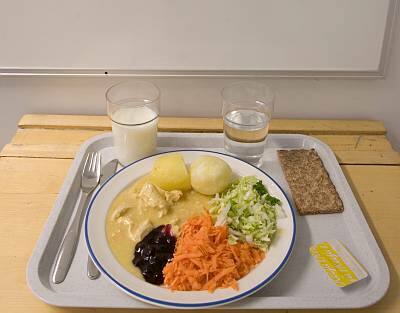 Can school lunches stem an obesity epidemic? Though five provinces already offer lunch (or breakfast) programs, Canada’s one of the last holdouts among industrialized nations when it comes to a fully fleshed-out national program. It’s not just a question of quelling hunger. 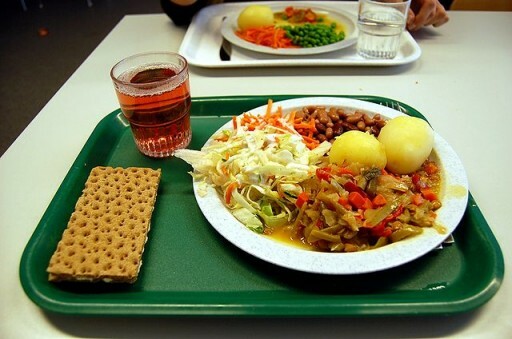 Could a properly-designed school lunch program help stamp out childhood obesity, thus reducing affiliated diseases and quashing healthcare costs? 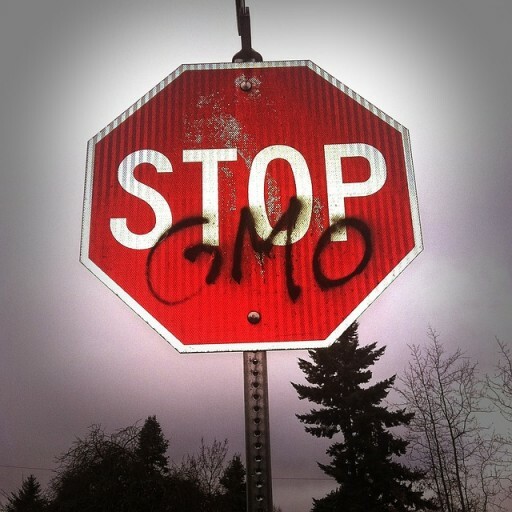 A coalition of food organizations seems to think so. The proposal for a national program will be a bumpy ride, however: getting all provinces–and politicians–to agree on details, not to mention the parliamentary maneuvering needed to pass something of such magnitude. However, the longer a potential fight, the more hastily one should get in the ring so as to not avoid eventual burnout… as we learned from our neighbours to the South. It’s up to us. What do we want our elected officials to focus on? Prevention? Exercise? Mental health? Could something like this help the next generation of Canadians enjoy a healthier childhood and a longer life? Read an interview about it in the Tyee. That’s not a character judgement. I’m talking about household waste. We allegedly threw out the most garbage in the world per capita in 2013. We continue to be one of the planet’s most egregious food wasters, squandering enough to feed a small country. Or maybe a large one. There’s also that pesky issue of the emissions caused by moving around so much wasted food. Oh, and the $31B we’re flushing down the drain. How stupid. And sad. And avoidable. If we don’t begin to turn this around quickly, the economic and environmental impacts may well see us drowning in our own waste. On a more hopeful note, campaigns like UK’S “Love Food, Hate Waste” are coming to our soil this year, and programs like Second Harvest are helping to make a difference. More is needed however. 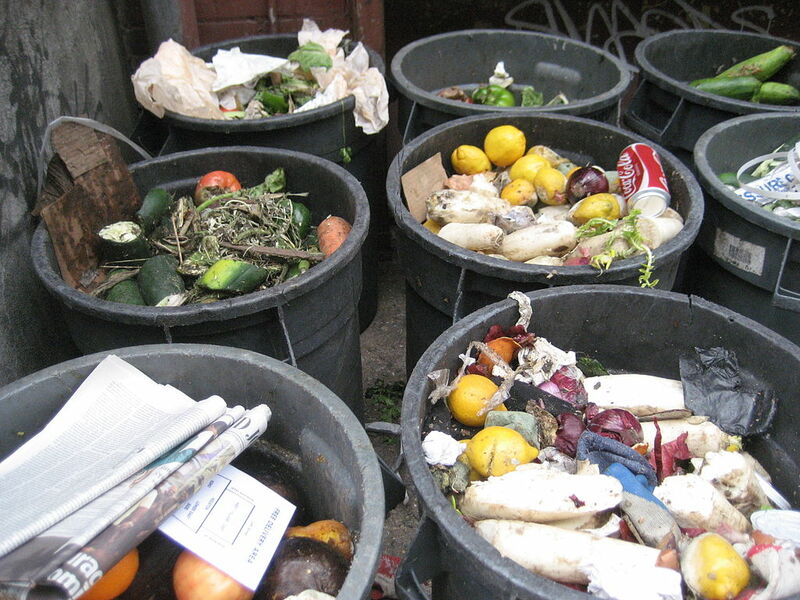 Beyond handy checklists, we need to lobby lagging local governments (such as Montréal) to adopt compost pickup or to punish supermarkets or large restaurant chains for the added strains they are putting on the system. Yet, if the real problem is with chains, how can we really stop them wasting so much food? We can’t. However, they can only waste food if they have customers to produce it for. Avoiding the big chains in favour of farm boxes, other delivery schemes, growing food in community garden plots, etc. are tiny ways to stem the flow. Can we solve food insecurity in the North? A chronic problem, it’s one about to grow in 2015. 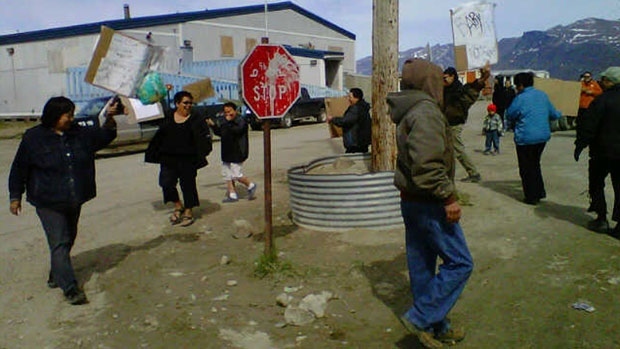 With the population of places such as Iqaluit growing quickly, an already-difficult situation is being compounded by one of the youngest populations in the country. Less and less people are hunting. Food prices continue to spike and food banks can barely keep up. Parliament exploded with this issue late in 2014 (after the UN got involved in 2012), yet very little action can be deciphered. Let’s hope 2015 sees that happen. Follow this column for writing on food issues (and hopeful initiatives!) both in Montréal and worldwide. Here at Food & Drunk, we often talk about what’s going on locally. Yet to frame the city’s food beat, it’s important, once in a while, to place things in a global context. As I did last year, I wanted to take a moment to look back at what mattered in food in 2014. Here’s an eclectic list of eight touch points. 2013 was the year 3D printing became a household term (even if not yet a household object). In 2014, it began to gain culinary traction. From its origins in simple sugar solutions, we started to see applications ranging from pizza to nursing home meals to interactive art installations. Protein-rich and as-of-yet untapped by global foodways, insects were in the news this year thanks to several startups seeking to exploit their nutritional value. Though many cultures around the world would hardly find this innovative or newsworthy, the Western press started to take a new global movement seriously—one that includes entomologists, chefs and urban agrarians. 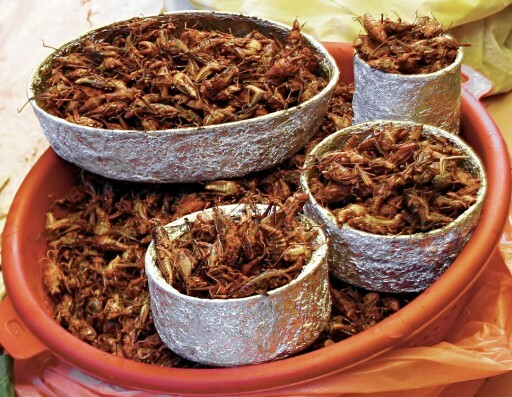 Montreal even hosted an international conference on comestible bugs as part of the Future Food Salon (after all, we are the proud home of the Insectarium…remember?). 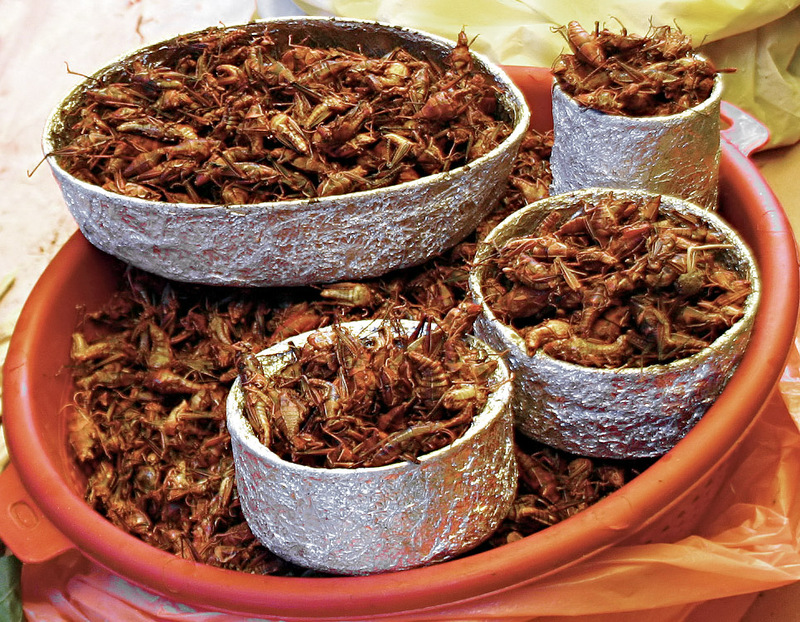 Prediction: we’ll not only see edible insects in the headlines in 2015, but also on our plates. What was once simply a thorn in a restauranteur’s side became a person to name and shame in 2014. The “shame on no shows” movement gathered great steam, only to fizzle out quickly. However, whether by design or organic growth, a message had stuck. Diners suddenly seemed more conscious of the economic ramifications of this erstwhile frivolous act (especially to small businesses). 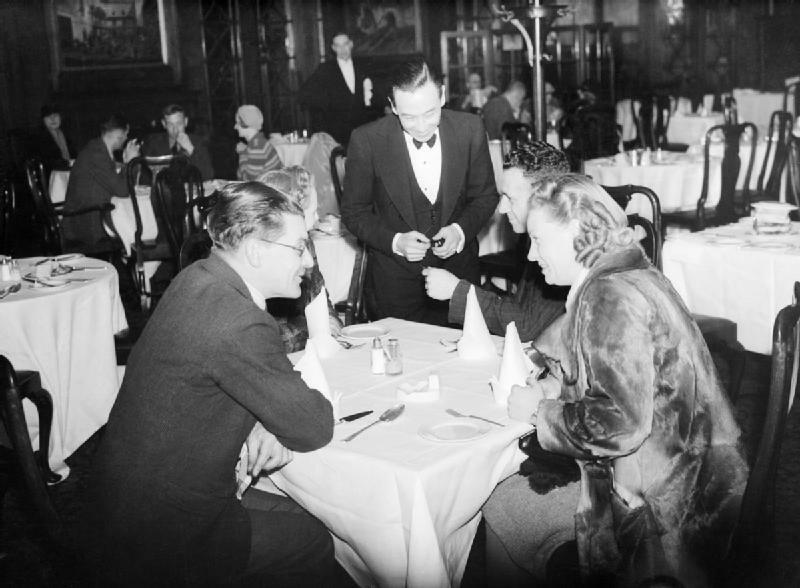 In the process, Quebecers were forced to confront the antiquated laws that hinder restaurants, placing them on an oddly unequal footing with similar services and outings (such as hotels or concerts). In Canada, the answer came sooner than expected. 2014 heralded a tipping point of sorts for the fusion between aboriginal cuisines of many types and mainstream Western cuisine. We saw Rich Francis show his stylings on Top Chef Canada, Doug Hyndford’s self-described “Métis-fusion” garner national attention in the Gold Medal Plates, and restaurant openings such as the Painted Pony Cafe in Kamloops and Borealis in Toronto. The movement is only just beginning however. Though US-based, this interview with Chef Loretta Barret Ode of the Potawatomi Nation sheds some light on the issues and opportunities involved. CRIIGEN’s hotly-debated GMO study was republished this year, albeit in a new journal, after a momentous 2013 retraction by Elsevier. If you haven’t yet heard—in some way, shape or form—about the Séralini affair and the utter furor it has provoked on all sides—start with the Wikipedia entry. The most valuable contribution of the Séralini affair is how it got us talking, thinking and strategizing about our relationship to genetic modification. How we interpret its influence in our midst. In our lives. In our environment and our bodies. I’m the last to pronounce on whether it truly was dodgy science or not, but it’s impossible to refute that, by virtue of the controversy alone, the study has had a greater impact on popular consciousness (and even legislation) than almost any other in recent memory. For this alone we should be grateful, as it guarantees we’ll stand up and pay attention to the multiple ways in which the effects of GMOs can be interpreted. It’s not hard to predict that GMO studies will be held to ever-higher standards and thus reveal ever more useful data—in part thanks to the Séralini affair. We should have seen this coming. In the last few years, meatballs have slipped onto hipster, even fine dining, menus. This year the meatball hit pitch fever. Meatballs were extolled left and right by celebrity chefs. Meatball restaurants opened in New York, Toronto and LA. Meatballs were made on virtually every episode of Top Chef. And to cap it all off: we got our very own Meatball House on Notre-Dame. Kids eat a significant portion of their meals at school. We all know that a bad childhood diet has links to diabetes and obesity. What could possibly be “controversial” about making school lunches healthier…especially over a gradual ten year span? Ask House Republicans in the US. The latter group pulled out every stop to block reforms to the National School Lunch Program, despite the almost laughingly benign nature of the changes. For example, one “hotly contested” rule merely asked that sodium levels not surpass the total of a six-pack of chicken nuggets with a side of fries at Burger King. Despite the ugly resistance, talk of school lunches soon went viral which, ultimately, might be a subtle win for Michelle Obama’s initiative. One of the most significant (and underreported) food stories of the year came out of Jordan, where the UN’s World Food Program built a supermarket inside the Azraq refugee camp. The camp, on Jordan’s northern border with Syria, might be the fastest-growing in the world, with a population that is estimated to quadruple to 40 000 in the next few years. In providing refugees with the semblance of a “more normal life,” the WFP publicly challenged its own long-trodden distribution strategies. In turn, it forced many observers—privileged people from afar— to challenge outdated notions of food aid. Selecting and cooking one’s own food, even in dire situations, was finally brought to the forefront as a key strategy in maintaining human dignity, morale and even life. It was such that John McKenna penned a highly thought-provoking article in The Guardian questioning whether cooking should be considered a human right. Food for thought indeed. Thus ends Food & Drunk’s eclectic look back at food in 2014. We’d love to hear what you would add to the list! 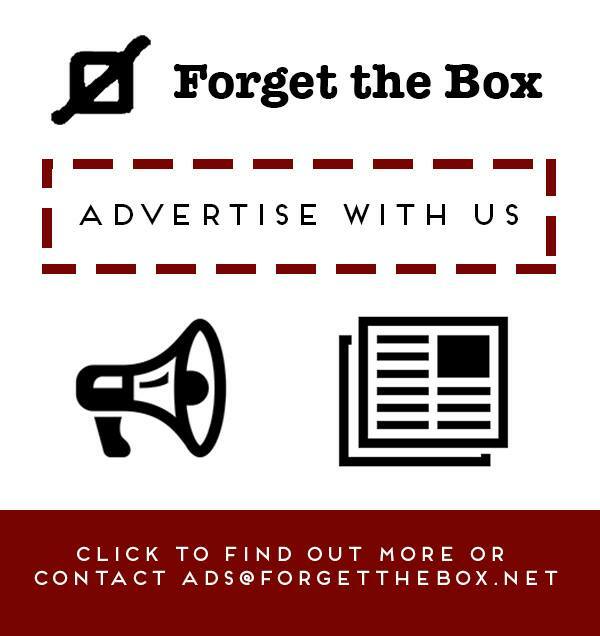 Leave us a comment below or Tweet @ForgetTheBox or @JoshDavidson. We look forward to covering more food issues and trends in 2015! The other night I was having a few drinks at new-ish, over-loud Plateau bar, Les Torchés. About one hour in, an adjacent bachelorette party chose to launch into a glass-shattering a cappella version of “I Believe I Can Fly”. This was the perfect moment to escape out onto Mont-Royal and test out a nearby sausage joint I’d heard about. 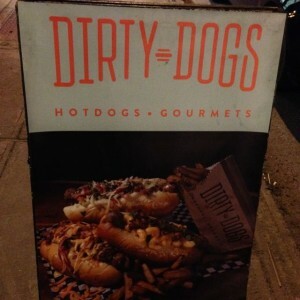 I’d been urged on more than one occasion to try Dirty Dogs, a tiny shoebox of a grill on Mont-Royal just east of St-Laurent. The long eight-seater serves only hot dogs. With single franks priced at $8–9 a piece, I took a shot, assuming their chefs knew how to handle a wiener with pride. My assumptions paid off…for the most part. I asked the server as to the signature dog and was instantly pitched on the Mac n’ Cheese dog, whose name is pretty self-explanatory. (Self-styled) food critic that I am, my mind was made up: I would ignore his advice completely. Otherwise, how could I claim for this to be a true exam? I picked a few random options. 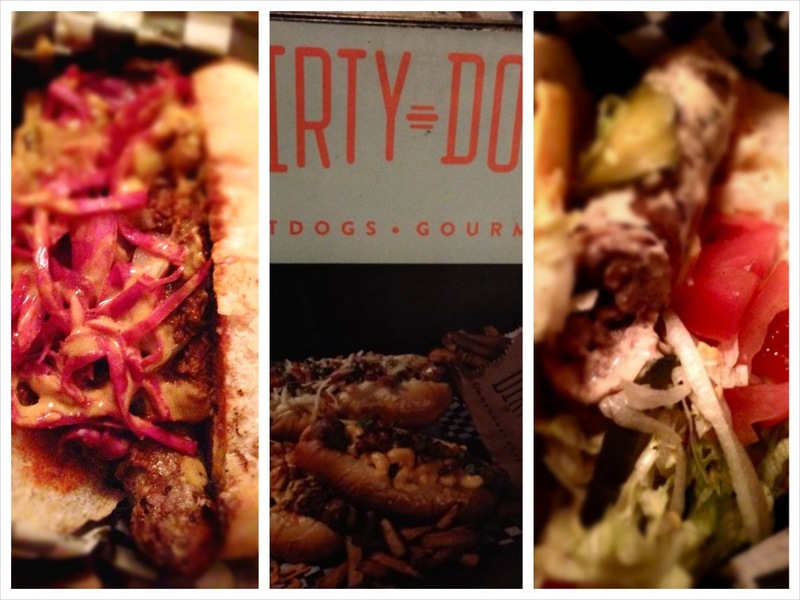 Open for seven months now, Dirty Dogs had recently expanded their menu. So I expected them to be up to any task, at any hour. First up was The Boss, which is, admittedly, something of a fan favourite. A wholesome beef sausage heaped with a “Dr. Pepper”-infused chilli and some kind of slaw, this was a beast of a sloppy bite. Had I had a few more beers before this, it would have been sinfully spot-on. Sadly, most of my faculties were intact, and though I found the sausage itself near flawless, the chilli was decidedly sugary. Now that’s not really a criticism given I ordered something with Dr. Pepper in the flavour profile. However an abundance of salt combined with this sweet touch pushed the whole thing a bit too far into drunk food for my delicate palate. I know, I have only myself to blame. The cabbage balanced things out on top and the bun was firm enough on the outside to avoid chilli seepage while spongy enough on the inside to soak up the sauce. Keep in mind that American cheddar is processed slice cheese (different definitions on different sides of the border). Again, this was not a bad thing. In fact, it suited the tangy, crumbly sausage (pleasant and not-too-greasy), acidic dill slivers and mounds of lettuce quite nicely. A nostalgic little dog, decidedly less rowdy than the first. Other than a wacky hint of nutmeg that ran throughout both dogs—a festive touch perhaps?—I had no major qualms with these ‘furters. I actually like nutmeg, so if anything, I was rather intrigued. What’s more (though I didn’t try them), new options for the standard sausage include chicken and vegan. So now, no one is left out! Given the amount of new (and old) drinking holes on the strip (with more opening up this winter), I have no doubt you’ll find yourself wandering into Dirty Dogs yourself some evening soon. My only tip: save it for after the bar. For years Colleen Risbey was frustrated there were no late-night delivery options available for vegans in Montreal. 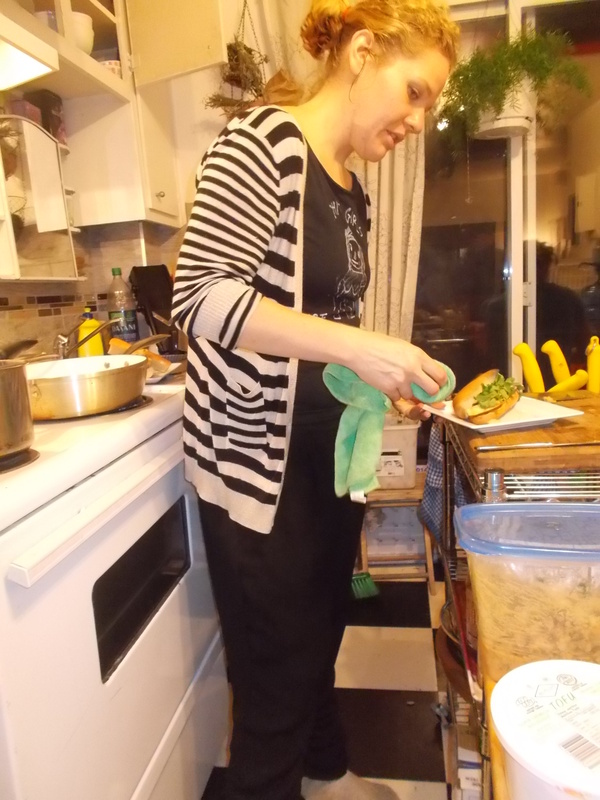 An experienced chef, Risbey was also determined to start cooking more food that she was passionate about. So after three years of planning and scheming, Risbey is now the proud owner of her very own business. 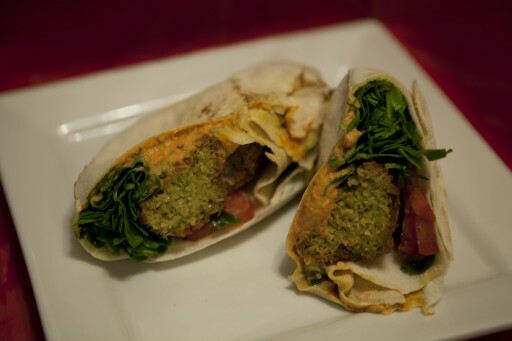 La Tomate Roulante is a delivery-only restaurant which serves vegan munchies to those who stay up late in St-Henri, NDG and downtown (as far as Guy). I stopped by La Tomate Roulante’s headquarters in St-Henri recently to give vegan take-out a try, and learn how Risbey plans to accomplish her mission to “feed the people” of Montreal. Launching any new business is risky. It’s especially true when your new venture is in a saturated market like the restaurant business. But the reality that most restaurants fail didn’t seem to phase Risbey one bit. “More than half the restaurants I used to work in are now closed,” Risbey declared very matter-of-factly. Risbey is adamant that her menu items will always be financially accessible to anyone. “It’s really important to me that anyone can afford to buy my product. Too many people end up eating crap like McDonalds because it’s the only type of food they can afford. It IS possible to eat well and cheap.” Risbey’s entire menu, from sandwiches to salads to desserts, is available for five dollars or less. For the tasting Risbey prepared three sandwiches, all with Asian and Mediterranean influences. First up was Risbey’s flagship sandwich the Avocado Bahn-Mi: a French baguette with vegan garlic aioli, avocado slices, sautéed nappa cabbage, carrots and smoked tofu topped with red onions and cilantro. A sucker for anything with avocado in it, I was immediately hooked after the first bite. While Risbey may feel the “Avocado Bahn-Mi” is her strongest menu item, I felt each subsequent item she presented was even stronger. The next sandwich I tried was the Nilufar Creation: Nilufars falafel, spinach, roasted garlic and pepper hummus, marinated cucumbers and fresh tomato in a pita bread. 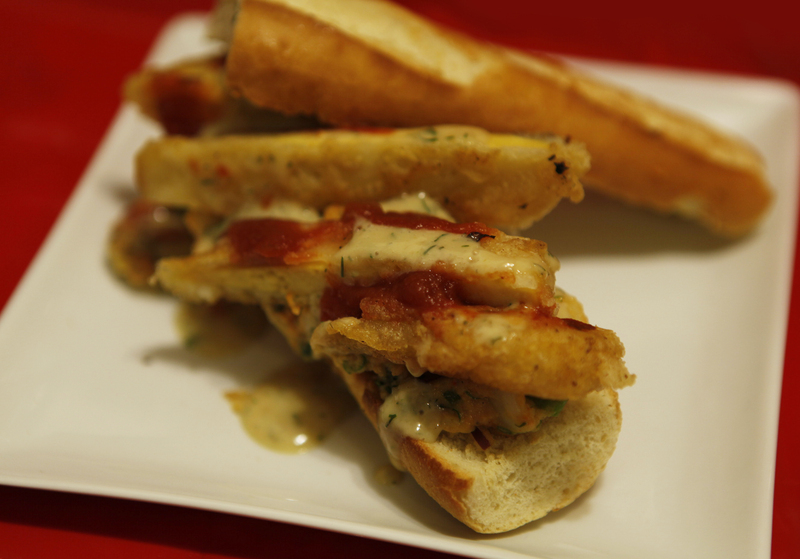 The final sandwich I tasted was The Alfresco: a toasted baguette with smoked paprika potato salad, vodka battered and double fried tofu with a double date chili sauce and maple dill sauce. 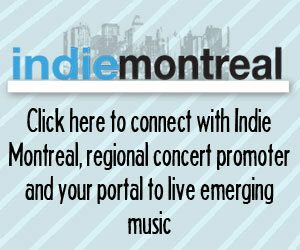 La Tomate Roulante runs from Thursday to Saturday, 9p.m to 4a.m. For contact information visit their website, twitter or Facebook page. I love cream soups. Cream of broccoli, cream of mushroom, cream of leek, but my ultimate favorite has always been: cream of tomato. When I went vegan several years ago, it wasn’t even a challenge to continue making cream soups without dairy or other animal products. Everything can be veganized, and in my opinion, because the dish is rendered cruelty-free, it becomes even more nourishing and delicious. In my cookbook, Cooking With Amore, I share with you my “quinoa method” for making soups thick and creamy. Simply by adding a small amount of quinoa, usually 1/2 cup or less, to the vegetables while they are cooking, and then blending the soup, the result will be a creamy vegan masterpiece. I created quite a few of these quinoa-cream soups and included many in Cooking With Amore, but for some reasons, I had not yet attempted my favorite one of all: cream of tomato (fear of failure, perhaps?) This week, I thought it was time to get to work on that. When I sat down for dinner with my newly-created vegan tomato soup, I was so glad I finally did it. I ended up eating three bowls! It made me think that a grilled cheese sandwich was all that was missing to make this meal sheer perfection. Daiya makes such delicious vegan cheeses of all kinds – I love their sliced cheese for making my grill cheeses. They even offer an amazing Grilled Cheese Cookbook as a free download! In addition to the quinoa, I used a couple more ingredients to create a creamy taste and texture for this soup: potato, black beans and soy milk. These extra ingredients served not only to increase the nutrition of the soup, but also to effectively counter the acidity of the tomatoes. 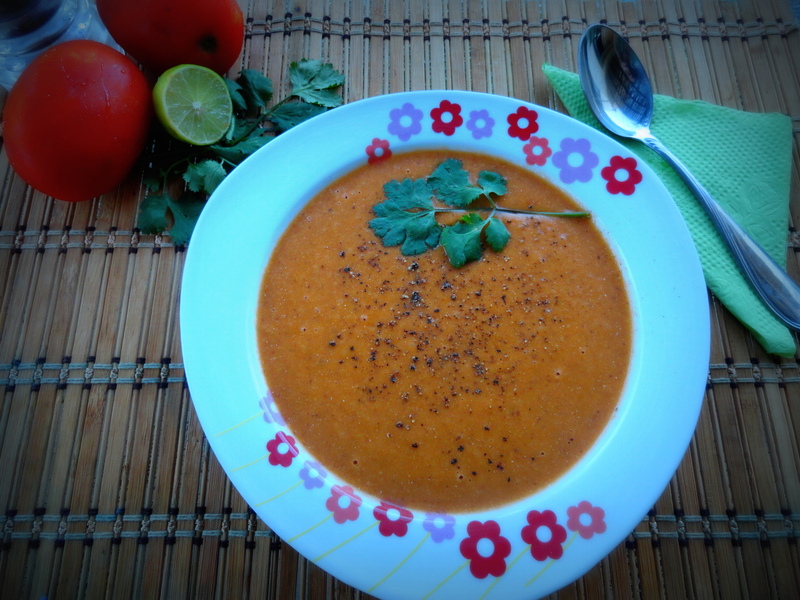 This is one challenge we have with cream of tomato versus other cream soups: the acidity of the tomato. But much like with tomato sauces, this is an issue we can easily address and balance out. Here’s my recipe for a big batch of delicious, nourishing vegan cream of tomato soup. You can freeze some for later. I hope you enjoy it! 1. In a large pot, heat coconut oil. Add chopped onion, garlic and potatoes. Add 1/2 cup of water and allow to simmer slowly. 2. In order to remove the peel from the tomatoes, bring a separate pot of water to a boil. Drop tomatoes into boiling water one by one. After 1 to 2 minutes, remove from heat, drain the water and allow to cool. Once tomatoes are cool, peel off the skin and discard. Chop tomatoes and add to the simmering vegetables. Sprinkle some Himalayan salt. Once the onion and potatoes appear to be getting soft, add the black beans and quinoa. Add remaining water and let simmer. 4. Once the quinoa appears cooked, add soy milk or additional water. Turn off heat, and allow to cool. 5. Once cool, place a small batch of soup at a time into a blender and puree until thick and creamy. If you want to thin out the soup, add more water at any time. Mix all pureed batches together and reheat the portion you are ready to eat. Taste test to see if more salt is desired. Store the rest in the refrigerator or freezer. Follow my vegan adventures on Facebook, Instagram and Twitter. How To Make The Best Popcorn In The World! Many people have told me how much they love my popcorn, so I decided to share my method with all of you. 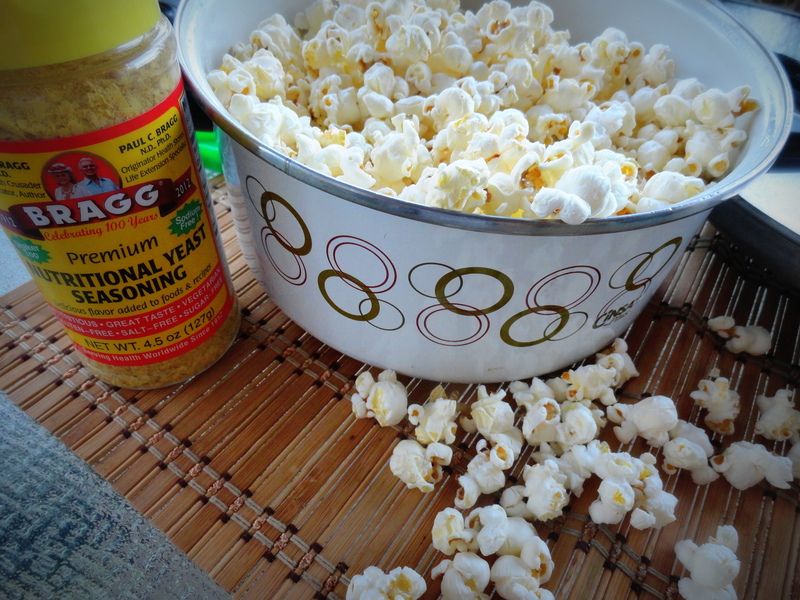 I learned it from watching my mother prepare popcorn for us on our fun movie nights! Miss you, Mommy! I make my popcorn in a big pot on the stove top. I prefer the flavor of the popcorn when I make them this way, rather than using an air popcorn machine, although this is another option you can try. When using the stove top method, believe it or not, the material that the pot is made of will influence the taste and texture of the popcorn. In my experience, it is best when the pot is steel with porcelain enamel or simply stainless steel. The first step is to thinly coat the bottom of the pot with your choice of cooking oil. Depending on the size of the pot (I use a standard size pot typically used for cooking pasta), usually about two tablespoons of oil is plenty. Coconut oil is a good choice since it is an oil which doesn’t denature quickly at high temperatures, like olive oil does. That means that coconut oil retains its healthful properties even when we heat it, whereas olive oil does not. Another oil I enjoy cooking with is grapeseed oil, however, its healthfulness when heated is debatable. I enjoy grapeseed oil because of its light taste and texture. Some people have written that it is stable at high temperatures, while others disagree. For popcorn, I prefer the outcome when I use grapeseed oil. The advantage with using the air popcorn machine is that no oil is necessary at all. 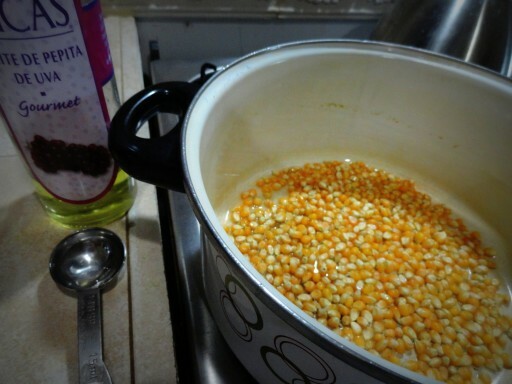 You then add the popcorn kernels, about a handful, to cover the bottom of the pot evenly, but not more than that, because then the popcorn won’t have enough room to expand. Cover the pot and turn on the burner to high, but not maximum. Start shaking the pot frequently, either by rubbing it directly on the burner, or lifting the pot slightly and shaking it. This will allow the heat to touch all the kernels evenly and within a couple of minutes you will hear that delicious sound: popcorn popping! If you have dogs, or birds, and sometimes cats too, beware, they love popcorn as well! Continue shaking the pot often until the constant popping slows down, and before it stops completely, remove the pot from the heat. Lift the lid and there you have all your beautiful popcorn. Now for the choice of toppings – this will make the popcorn extra yummy, and for me, I choose vegan toppings. I get the most compliments when I sprinkle garlic powder, Himalayan salt (or onion salt for added flavor) and nutritional yeast for a cheesy taste and aroma. With respect to the garlic, you can also mince garlic and add it to the oil and kernels, but the garlic inevitably burns by the time the popcorn is done so sprinkling garlic powder at the end may be preferred. The toppings are yours to experiment with! Here in Los Cabos, Mexico, I get my organic popcorn kernels, nutritional yeast, and my coconut oil from a lovely little store in San Jose del Cabo called Green Goddess. I was thrilled to discover this place since it carries many of the organic and vegan ingredients I like to use in my recipes. They have a lovely selection of nut milks and butters, and many gluten-free pastas. I also get my quinoa and mung beans in bulk at the Green Goddess. They make phenomenal smoothies and cold-pressed juices! 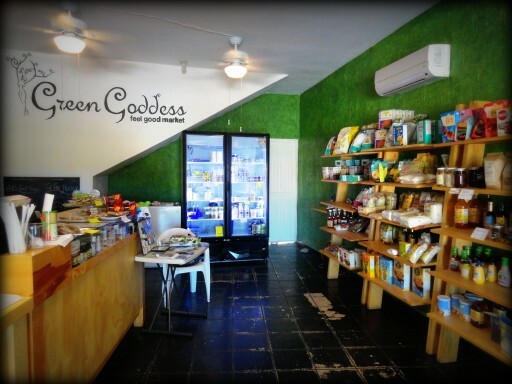 The Green Goddess is a family-owned and operated business (they are originally from Alberta, Canada). Kristen Erickson, the family’s competitive runner, is usually there to greet you with a big smile and has a wealth of knowledge about healthful living to share. The next time you come to Los Cabos, be sure to check them out! Make your week amazing and let me know how the popcorn works out for you! Follow my vegan adventures on Facebook, Instagram and Twitter. Get Cooking With Amore and start cooking with love today! We humans love our traditions. Some have persisted for valid reasons. Others? Well, I think on some level, we just enjoy the drug of empty repetition. I’ve long been an eager proponent of the history, rituals, and heritage of the meal. But sometimes, we confuse the latter concepts. Some traditions are really just calcified habits – long grown irrelevant. To find their rightful place as a cultural and an economic force, restaurants need to transcend the “tradition” of front-line staff, working for tips. Now, I realize that I’m treading on dangerous ground. Thou shalt not criticize the 20% gratuity, especially here in La Belle Province. But after years of experiencing both sides of the gratuity system, the situation has become as clear as day to me. The compensation methods, and hence the respect for and the job security of the server has not kept up with its rapid professionalization. 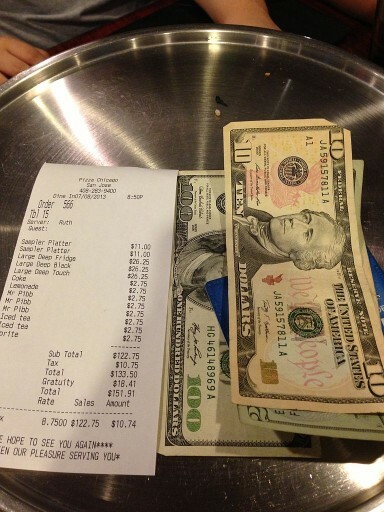 A restaurant bill in the US showing gratuity charges. 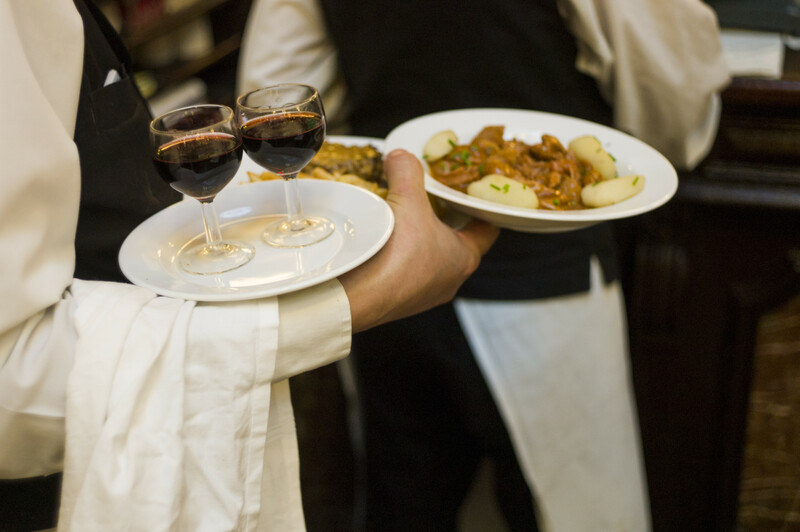 Commensurate salaries and gratuity charges are common in many parts of Europe and Asia and have been shown to correlate to better overall wages, more job security, increased professional development opportunities and better employee engagement. There are college degrees for restaurant service now, for God’s sake, not to mention mixology, tableside prep and food service theory. (More on the odd tension of these degrees in a future article). Artful dining and drinking are finally entrenched as legitimate “cultural fields” here in North America. The wealth of highly skilled servers has long outweighed the pretenders. It’s time to shake off the cobwebs and allow the industry to occupy its rightful place. Where else are consummate professionals still legally encouraged to work for well under minimum wage? The consumer’s echo? How unfair. I’ll just leave a bigger tip. Well, I do that, and I used to get tips both big and small. That’s the problem. Instead of thinking beyond the issue, everyone just screams out to increase tips. We are perpetuating a system that is ultimately harmful to servers, restauranteurs, and eaters. Why, in this one industry alone, are all the tried and tested responsibilities of the owner — adequate compensation for skilled employees, evaluation of roles and performance — deflected so heavily to the customer? Tradition? Job instability, high turnover, and an uncomfortable and unnecessary dynamic for the client. That’s a tradition! An ineffable part of restaurant culture. But who is really winning from this tradition? And do we realize it’s predominantly a North American addiction? I’m continually amazed by how rarely we compare the resto to similar cultural experiences. For some reason, we blindly accept that over-regulation and unquestioned traditions can utterly stifle in this one case — for no real reason other than the resistance to change. I’ve ranted in the past about how utterly counterproductive it is for this province to outlaw restaurant tickets, or to let people pay for reservations. When it comes to working for spare coins, this old, logic-defying current prevails: Servers are inherently different from workers in cognate industries. The problem is, that is just not true. Perhaps we just feel guilty about being served food? Does it seem too much of a luxury to be compensated like a normal part of the economy? Try this offhand analogy: riding by plane is luxurious, yet I don’t hear of passengers being asked to invent a rate for the pilot once they’d safely landed. Servers are not a special class. They are simply skilled people with jobs. Their skills and experience are as valid as any other profession. Yet there is some weird mystique to the profession that fogs our view. The latter is one of the nasty byproducts of an empty tradition. It goes something like this: My server is akin to a street performer, s/he should have to surprise and delight me if I am to allow him/her to make ends meet. Firstly, such expectations are not consistent with those we have for other services, and other skilled professionals. Customer satisfaction, typically, revolves around the expectation that the person we deal with is competent — hopefully decent — in their role. In most situations, this is easily enough for us to expect someone to be fairly compensated. Second, a server is also not a freelancer in a public place. A server is an employee generating revenue for a government-sanctioned business. The restaurant industry is one of the most heavily legislated in the province, which is about the the furthest thing (on the surface) from an emergent street economy. Why not just start paying servers like everyone else, which is to say paying servers based on normal principles of compensation? I’m no expert on the latter, but from my own life, it usually involves one’s prior levels of experience and performance year over year. Some say serving is a sort of performance. Fine. Yet unless they are being defrauded or willingly gigging for free, even, say, actors and musicians know to a much higher degree than servers the terms of their contract before performing the actual work. 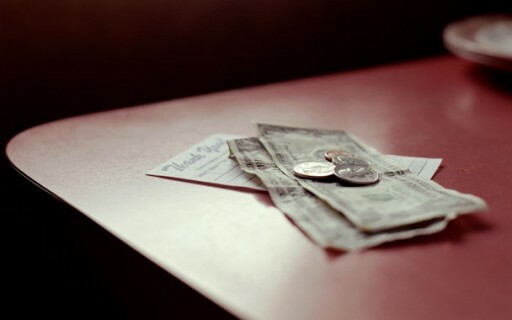 Because when it comes to a server’s core earnings (tips), the contract is wholly unkonwn. The real contract is not with their boss. It’s with their diner. And they do not have permission to interview diners before the first glass of water is brought to the table. The problem, therefore, is not the tip itself. People should always tip in life if they feel compelled, and cash is only one (albeit efficient) vehicle to acknowledge one’s actions, or to express gratitude. But regular wages — eventually salaries — are the only way to keep servers and restaurants stable and relevant in today’s economic and cultural sphere. In no one’s fantasy is the restaurant still an economic or cultural experiment. Rather, it’s an institution, for whom structural change is long overdue. So how can restos afford to pay servers real wages? Maybe increase booze markup, add a service charge, hike menu prices; in other words, let us diners absorb the cost of a newly stable profession. Because in many ways, we already are. 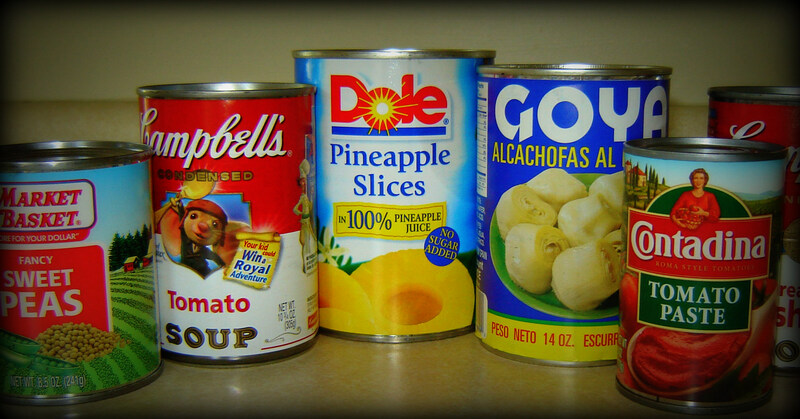 The devastation of Hurricane Odile: How canned food saved my life! As you all know, I’m the first person to poo-poo canned food. I also advocate whole foods and lots of raw, rather than processed foods. Living through a devastating hurricane, however, changed my tune! 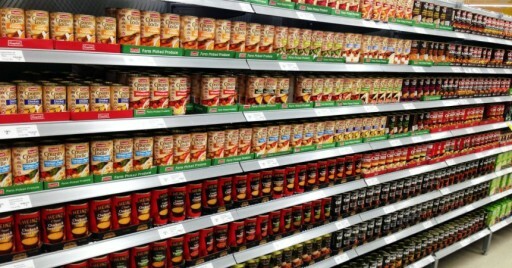 I was surprised to discover that sometimes, canned food and avoiding raw is actually the way to go! Hurricane Odile crashed into Baja California Sur on September 14, 2014, a date many of us in Mexico are unlikely to forget anytime soon. I prepared as best I could, but how can you ever fully prepare for something you have never experienced before? Norbert the week prior was a fresh breeze in comparison to Odile! We were all told to take in all patio furniture, stock up on food and water, fill up our gas tanks, secure our windows and doors, and pray for the best. This is what I did, but for me, stocking up on food means lots fresh produce and some frozen items. Right! Without electricity for over two weeks due to the hurricane knocking down almost 8000 poles, in a very hot climate, how far do you think that food took me? In two days, everything that was uneaten was either spoiled or on its way to expiring. I was surprised at how quickly frozen peas, for example, can go bad. Within one day of no refrigeration, they had spoiled. If it weren’t for canned food, none of us in Los Cabos would have had anything to eat. The grocery stores were all severely damaged by the hurricane, and what was left of them got looted. I was scared and saddened not only by the wreckage of the hurricane itself, but also by the ordeal of the aftermath. We had no power, running water, phone or Internet for over two weeks. My home was severely damaged and flooded. Not only were my windows shattered, but the ferocious winds ripped out the frame too! My whole bedroom, in fact, was gutted out, closet doors, clothes and all! 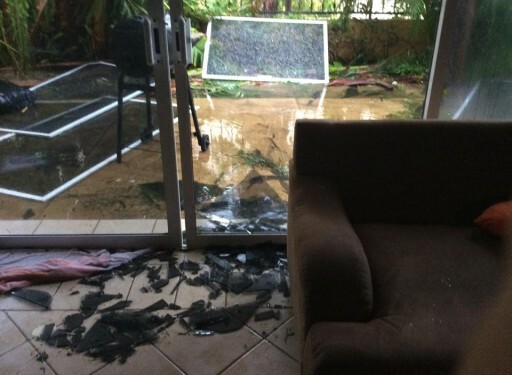 Unfortunately, my living room did not fare much better, broken glass everywhere and furniture soaked. 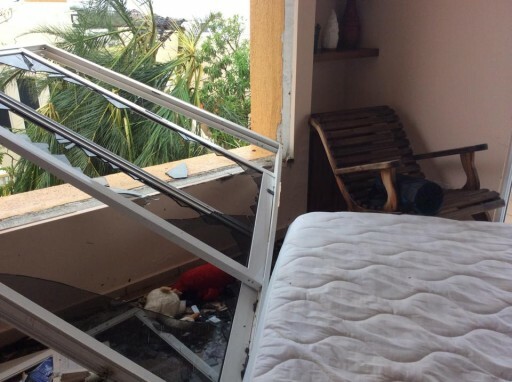 Once the windows and patio doors had shattered on that horrifying night, water gushing everywhere, I wasn’t sure my beloved animals and I would survive. As water dripped from the light fixtures on my ceiling, from all my air conditioning units, my laundry room overflowing with dirty water into my kitchen, I prayed the house would not cave in on us! Thankfully, none of us were injured (we hid in the bathroom for hours) and I am just so grateful to be alive! 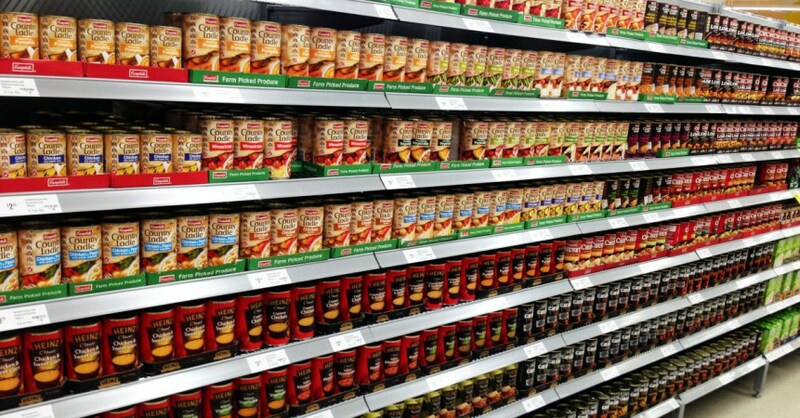 Canned food is what we lived on for weeks and even if nutritionally inferior to fresh, whole foods, it kept us alive! In fact, I had my first salad a few weeks after the hurricane when one store reopened, and by the next morning, after a night of severe stomach pain, I had a high fever. Two days of fever, muscle pain, nausea and diarrhea, urged me see a doctor who lives in my community. He said I had a bacterial infection, likely from contaminated water or vegetables. He prescribed antibiotics and told me to avoid raw food completely. He explained that after natural disasters, the level of bacteria is out of control. This experience has surely taught me a lot about survival, but mostly it has been a lesson in hope and gratitude. I was pleased to actually meet my neighbors, talking to some of them for the first time, and I was really impressed by how we came together as a community and helped each other out. Although many of us had lost so much, and we had so little, no of us went without basic necessities because we were all there for one another. 1 – I am grateful to Hurricane Odile for teaching me, in a very concrete fashion, the impermanence of all things. What incredible pride we get from acquiring things. A house, a car, a fat pay cheque – wow, these make us feel accomplished, successful. But really, they can and will be taken away at any moment. Similarly, all relationships end at one point. They all end in the physical realm, whether they be through break-ups, or through death. There is no permanence in the physical world, there is only change. The permanence lies only in the spiritual realm. Therefore, maybe, we should invest more in our spirituality (whatever that means to each of us) than in material wealth. Thank you, Odile, for teaching me the transitory nature of physical existence. 2 – I am grateful to Hurricane Odile for showing me how truly “wealthy” I am for having lived my whole life with running water, enough food to eat, a roof over my head, electricity, enough health to make a living and the possibility of getting better when ill, resources to help me achieve university degrees, the companionship of loyal animals, true friends and loving family. Thank you Odile, for showing me my riches. 3- I am grateful to Hurricane Odile for allowing me to experience the importance of community. We need one another. We belong to each other. Our purpose is to serve all beings and treat them with kindness and help all those in need. Thank you, Odile, for allowing me to experience the power of community. It seems to me that in those moments when much is taken from us, much of our true riches are revealed. Namaste. Follow my vegan adventures on Facebook, Instagram and Twitter. Looking for some vegan recipe inspiration? Get my cookbook, Cooking With Amore, and start cooking with love!